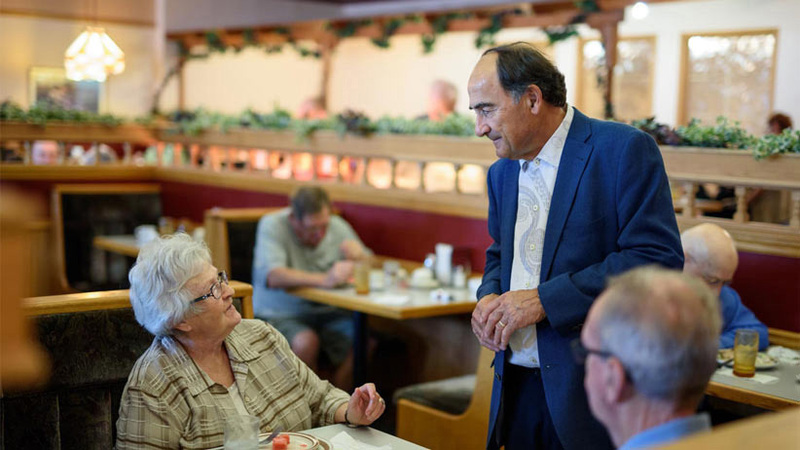 When told that his small Prairie town had, in profound ways, fallen off the statistical map of Canada, Walter Streelasky, mayor of Melville, Sask., is incredulous. Streelasky had no idea Melville had been rendered a “statistical ghost town” after the mandatory long-form census was cut in 2010, and fewer than 50 per cent of the one third of Melville’s 4,500 residents who got the voluntary National Household Survey that replaced it in 2011 completed the form. Melville still exists—but as a shadow. We know how many people live there, but nothing about them—where they work, their education levels, whether they’re married, single or divorced, how many are immigrants, how many are unemployed, how many live in poverty. Melville’s numbers, then, aren’t factored into Canadian employment numbers or divorce rates or poverty rates. According to Sask Trends Monitor, the high non-response rate in the province resulted in “no socioeconomic statistics about the populations in about one-half of Saskatchewan communities.” Nationally, we’re missing similar data on 20 per cent of StatsCan’s 4,556 “census subdivisions,” making a fifth of Canada’s recognized communities statistical dead zones. 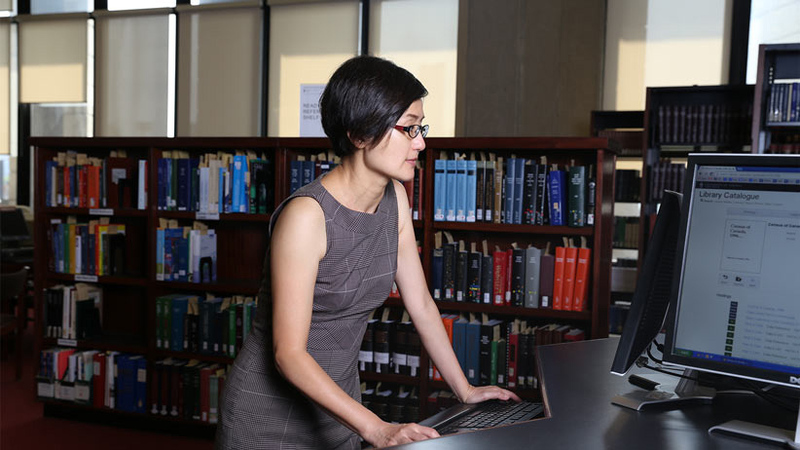 Protecting Canadians’ access to data is why Sam-Chin Li, a government information librarian at the University of Toronto, worked late into the night with colleagues in February 2013, frantically trying to archive the federal Aboriginal Canada portal before it disappeared on Feb. 12. The decision to kill the site, which had thousands of links to resources for Aboriginal people, had been announced quietly weeks before; the librarians had only days to train with web-harvesting software. 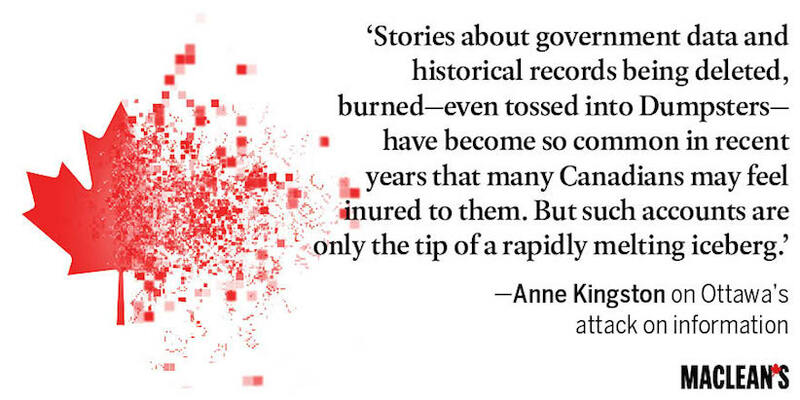 Stories about government data and historical records being deleted, burned—even tossed into Dumpsters—have become so common in recent years that many Canadians may feel inured to them. But such accounts are only the tip of a rapidly melting iceberg. A months-long Maclean’s investigation, which includes interviews with dozens of academics, scientists, statisticians, economists and librarians, has found that the federal government’s “austerity” program, which resulted in staff cuts and library closures (16 libraries since 2012)—as well as arbitrary changes to policy, when it comes to data—has led to a systematic erosion of government records far deeper than most realize, with the data and data-gathering capability we do have severely compromised as a result. How many Canadians live in poverty now, compared to 2011? 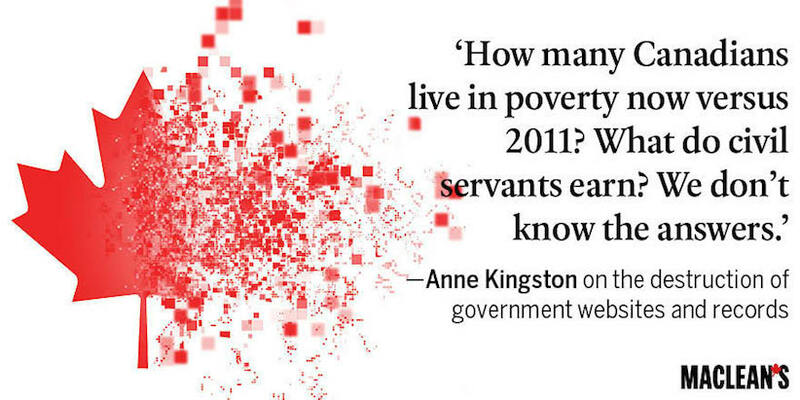 We don’t know; changes in income-data collection has made it impossible to track. Austerity measures, ironically, have resulted in an inability to keep track of the changes: StatsCan used to provide detailed, comprehensive data on salaries and employment at all levels of government; now we can’t tell where, or how deep, the cuts have been. Disappearing data is only one part of a larger narrative of a degradation of knowledge—one that extends from federal scientists being prevented from talking about their research on topics as mundane as snow to the Truth and Reconciliation Commission being forced to take the federal government to court to obtain documents that should have been available under Access to Information. The situation has descended into farce: Library and Archives Canada (LAC), entrusted with preserving historic papers, books, photographs, paintings, film and artifacts, was so eroded by cuts that, a few years ago, author Jane Urquhart was unable to access her own papers, donated to LAC in the 1990s. The result is a crisis in what Canadians know—and are allowed to know—about themselves. The threat this poses to a functioning democracy has been raised over the past several years, most recently, in the massive, damning June 2015 report “Dismantling democracy: Stifling debate and dissent in Canada” produced by Voices-Voix, a non-partisan coalition of more than 200 organizations and 5,000 individuals. Less discussed, however, is how data erasure also threatens the economy, industry, the arts, and the country’s ability to compete internationally. The 2013 report “Information management in the Canadian federal government” is a title not likely to attract the non-librarian reader. But the conclusions drawn by its authors, a librarian at Carleton University and an information-management consultant, are chilling. Isla Jordan and Ulla de Stricker describe a country “without access to large parts of its institutional memory, and leaders without access to the information needed for strategic decision-making.” Toni Samek, a professor at the school of library and information studies at the University of Alberta, puts it more succinctly. Canada is facing a “national amnesia,” she says, a condition that will block its ability to keep government accountable, remember its past and plan its future. Canada’s closed-data stance is taking root at the very moment “open data” and “knowledge economy” are global mantras. The OECD and World Bank have led the charge for open-platform disclosures. In 2013, the U.S. Food and Drug Administration launched openFDA to provide easy public access. Last year, the U.S. Federal Reserve posted full and revealing transcripts of meetings held by then chairman Ben Bernanke in the weeks and months leading to the 2008 recession—there for anyone with an Internet connection to read. U.S. President Barack Obama’s 2016 budget calls for an emphasis on making data “legally and practically” more accessible. Those dependent on these data balk at such claims. “Health Canada has improved its transparency in a few small areas, but overall, does an abysmal job,” says Joel Lexchin, a drug-industry watchdog and professor in the school of health policy and management at Toronto’s York University. “[It] doesn’t even make public a list of drugs withdrawn for safety reasons,” he says. Canada not only lags other governments, but also international business, says Jan Kestle, founder and president of Toronto-based Environics Analytics: “Everyone is moving toward setting up data-governance processes inside companies to collect information and safeguard it,” she says. But where digitization has helped other governments and companies make more information available, it is having the opposite effect here. The edict to eliminate information deemed “redundant, outdated and trivial” (known as “ROT”) gives federal managers licence to decide what data should be cut and what kept, says Li, the U of T librarian. “There is no transparency, oversight, or published criteria for the decision-making process,” she says. While the U.S. Federal Depository Library Program tracks U.S. government-publication digitization efforts, Canada has no such mechanism. It’s LAC’s mandate to preserve federal government information, but there has not been a comprehensive web crawl since November 2008. LAC is updating its “technical infrastructure,” a spokesperson told Maclean’s, and should have missing web archive content online by early 2016. In an interview with Maclean’s, LAC head Guy Berthiaume spoke of making LAC a “client-driven organization,” developing a three-year plan and digitizing a quarter of its archives. But the organization has suffered a 50 per cent cut in its digital staff, and received no additional funding in the 2015 budget. Yet elsewhere in government, claims of “digitization” can be a precursor to brick-and-mortar closures. Last month, the Professional Institute of the Public Service of Canada (PIPSC), the union representing some 15,000 federal scientists, claimed that Agriculture and Agri-Food Canada’s Lethbridge Research Centre, created in 1906, had been closed quietly. Agriculture and Agri-Food Canada spokesman Patrick Girard said it isn’t a shutdown, explaining that the government was simply “moving toward a digital-service delivery model, while keeping all materials of business value.” But according to PIPSC, its members are losing vital data. “They will have access to some information but in no way will they have full access; that’s not how digitizing works,” says Peter Bleyer, special advisor at the union. Government reports note that scientists were consulted in the process; Bleyer says they weren’t. Parsing the truth has become a national parlour game. Economic considerations are cited routinely to justify cutbacks in collecting, analyzing and digitizing information. A closer look at recent data erasure, however, suggests it runs counter to sound economic strategy. The glaring example is the elimination of the mandatory long-form census, a detailed survey of Canadians taken every five years. Its replacement, the voluntary National Household Survey, added $22 million to the cost of the 2011 census; the response rate dropped from 94 per cent in 2006 to 69 per cent, which makes the data totally unreliable. “A response rate of 75 per cent is the minimum required for sample accuracy,” says StatsCan’s former chief statistician, Munir Sheikh, who famously resigned in 2010 after Tony Clement, then industry minister, stated publicly that the decision to cut the long-form census came from within StatsCan. “The federal government misrepresented my advice,” Sheikh told Maclean’s, adding that ongoing cuts to the agency have undermined its credibility. StatsCan stands by the data: “The results for the 2011 census are of very high quality, as in previous censuses,” says Peter Frayne of StatsCan. Government, too, is operating in the dark, as evidenced last year when StatsCan was unable to provide auditor general Michael Ferguson with job data during the contentious debate over proposed reforms of the Temporary Foreign Worker Program. The Department of Finance was relying on data from the online classified service Kijiji to back its position. Cutting the Survey of Labour and Income Dynamics, a longitudinal study tracking economic well-being since the mid-’90s, left the country unable to measure changes in income over the longer term, says economist Stephen Gordon, a professor at Université Laval. It was replaced by the Canadian Income Survey, which uses a different methodology; now, old income data can’t be connected with new income data, he says. The upshot? Comprehensive Canadian income-data history currently begins in 2012. Yet tax-funded environmental monitoring, conservation and protection has been debilitated with the closure of 200 scientific research institutions, many of which monitored food safety and environmental contaminants. Some were internationally famous. The Polar Environment Atmospheric Research Laboratory in Nunavut, which played a key role in discovering a huge hole in the ozone layer over the Arctic, closed in 2012. Also shuttered was a brand-new climate-controlled facility at the St. Andrews Biological Station in New Brunswick. The original station provided writer Rachel Carson with documentation of DDT killing salmon in local rivers reported in her 1960 book Silent Spring, credited with giving rise to environmentalism. The effects of penny-wise, short-term thinking are being felt in some of our most important research organizations. Consider the changes at Canadian Institutes of Health Research (CIHR), the country’s primary health research funding agency, says Yalnizyan. Earlier this year, the CIHR outraged the scientific community when it announced that, as of September, it would no longer fund Cochrane Canada, part of a respected global collective known for “evidence-based,” systematic reviews free from commercial sponsorship and conflict of interest. But outlays for Cochrane—less than $2 million annually—were cost-efficient: For the $100,000 CIHR pays for a single “knowledge synthesis,” Cochrane can produce five. Failing to invest in pure science is ultimately bad for business, says Katie Gibbs, executive director of the advocacy group Evidence for Democracy. “It may not pay off in the short term, but it’s necessary to feed applied science,” she says, pointing out that many technological advances that drive our economy and quality of life—cellphones, satellites, GPS, MRIs, even Velcro—had their starts in government-funded basic research. Corak, too, has concerns: “Income levels are something Canadians should be as aware of as much as the inflation rate and unemployment rate: ‘How much money do they make on average? How is that distributed?’ ” Data erasure, unsurprisingly, is an election issue itself, with the NDP, Liberals and Greens all vowing to restore the long-form census. Also disturbing is Bill C-59—this year’s budget bill—which retroactively revised the ATIP law in an effort to exempt all records for the defunct long-gun registry, from any form of request, including complaint, investigation, judicial review or appeal. The change was made as Legault was poised to recommend possible criminal charges against the RCMP for withholding—and later destroying—gun-registry documents. By backdating the ATIP law’s revision to October 2011, the change effectively rewrote history, a “perilous precedent,” as Legault put it, that could be used by governments to retroactively rewrite laws. ATIP cases now clog the judiciary: The Federal Court of Appeal intervened earlier this year, when a citizen seeking information on the sale of military assets was told it would take 1,100 days. In 2013, an Ontario court had to order the federal government to release thousands of pages of documents detailing government involvement in residential schools withheld from the Truth and Reconciliation Commission. “It really got in the way of the truth-telling,” says Cindy Blackstock, executive director of the First Nations Child and Family Caring Society. ATIP delays affected a complaint her organization filed with the Canadian Human Rights Tribunal claiming the federal government discriminated against First Nations children, she says. An ATIP she filed in November 2012 was received in April 2013, after hearings started. The hearings were postponed when it was discovered the government had withheld 90,000 pages of documents. A pattern of disappearing information has raised questions about political interference, notably, after the Canada Revenue Agency ordered employees to destroy all text-message records. The concern is that the agency was covering up evidence of a crackdown on charities that opposed government policy. The vanishing of Canada has created a counterinsurgency—scientists, researchers, economists, civil rights groups, librarians and artists marshalling resources and their own time to monitor, expose, protest and create a new literature of knowledge loss. Li, for one, has taken preservation of national records into private hands by spearheading an effort with universities across the country dubbed LOCKSS—“Lots of copies, keep stuff safe”—to archive federal websites, an exercise not unlike trapping fireflies in a jar: “Without that or a print record, there’s no way of tracking change.” After the government changed Crown copyright policy, guidelines for legally reproducing its documents in 2013, Li went online for the old copy. It had vanished. In July, Evidence for Democracy launched True North Smart and Free, an interactive website documenting seven years of changes to how science is collected and used in federal policy decision-making. Meanwhile, as actual information vanishes, it’s being replaced by mythologizing historical narratives. As stations monitoring climate change close in the Arctic, historic missions in the North, notably, the Franklin expedition, are celebrated; at a time when veterans’-services offices have been closed and StatsCan no longer tracks military personnel, or wages and salaries of veterans, soldiers who fought historic wars are memorialized, with $28 million spent on the anniversary of the War of 1812, in one example. Yet LAC did recently add to the national archives, making its first purchase this April in almost a year: a parcel of 19th-century paintings, illustrations and journal materials from the Peter Winkworth collection of Canadiana. The single-most expensive purchase, at $46,750, was an 1883 oil painting of a fish hatchery in Newcastle, N.B. (part of Miramichi) by Edward Scope Shrapnel. The irony is acute. We’ve lost data, trashed records and stopped monitoring vital aspects of fisheries and acquatic life. But we’ve gained an idyllic rendering of an ecologically untroubled time that now serves as yet another indictment of what has been lost. The story has been edited to clarify the fact that one third of residents in Melville, Sask. got the NHS in 2011.